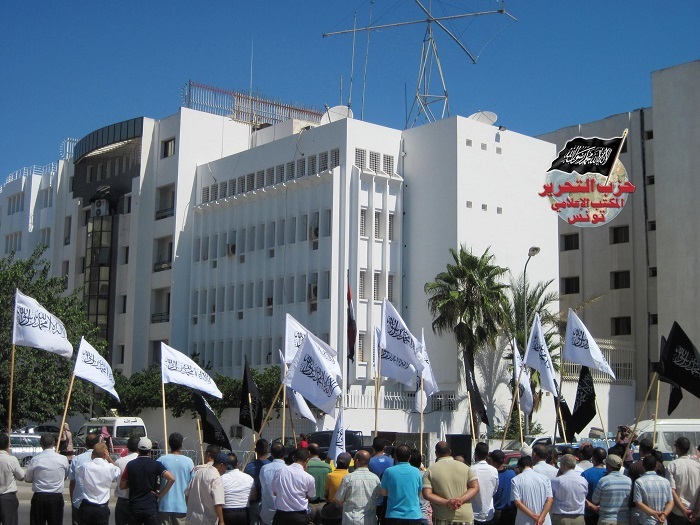 Hizb ut-Tahrir / Tunisia organized a protest before the Egyptian Embassy in Tunisia on Thursday, 8 Shawwal 1434 AH corresponding to 15 August 2013 CE regarding the bloodshed that occurred killing hundreds or even thousands of Muslims unjustly. These acts anger Allah (swt) and are not accepted by anyone. The Hizb members delivered short speeches reminding the people of Egypt that this is not the way to bring Islam but by the path of the Khilafah and not by democracy, which has inflicted Muslims with commotion and murder. America has permitted Muslims to be slaughtered at the hands of Sisi. They also appealed to the sincere Muslims in the armed forces to remove America's hand in power and establish Islam by the Nussrah of the sincere ones in order to resume the Islamic way of life.